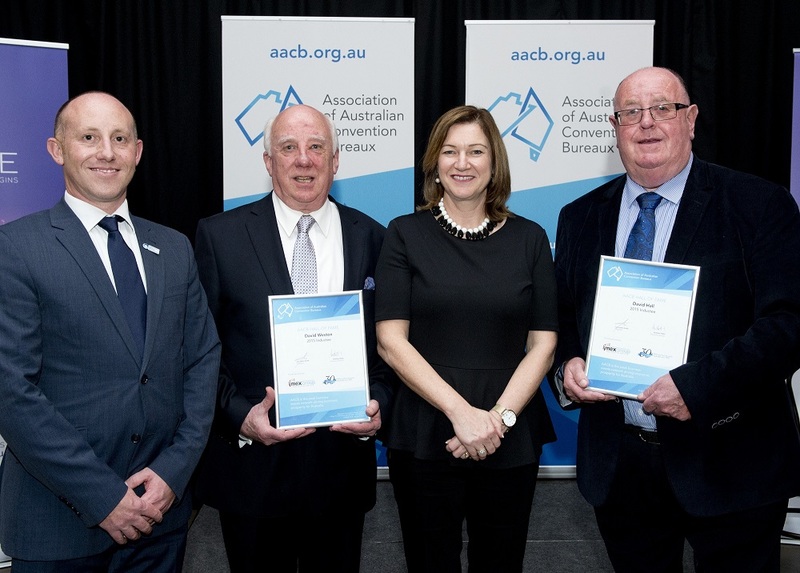 The Association of Australian Convention Bureaux (AACB) and IMEX Group are pleased to announce David Weston and David Hall as the inaugural AACB Hall of Fame inductees 2015. The induction ceremony occurred at AACB’s Staff Conference Gala Dinner in the Hunter Valley last Friday, 11 September. The AACB Hall of Fame was established to acknowledge AACB’s 30th anniversary and continued business events leadership and is sponsored by the IMEX Group. This award recognises individuals who have made a significant contribution to the advancement of Australian convention bureaux and the business events industry. It also provides a historical narrative of leaders that have grown and nurtured the industry to present day. David Weston was the inaugural Executive Director of the Tasmanian Convention & Visitors Bureau from 1978-1983 and served as the first Chairman of AACB. David Hall followed as the second AACB Chairman and was also CEO at Adelaide Convention Bureau 1980-1992 and CEO at Gold Coast Convention & Visitors Bureau from 1992-1993.